Vamp is one of those eighties horror-comedies you may or may not have caught late one night on Channel 4 or BBC 2 in the early eighties. I first became aware of the film when I saw Tom Hodge’s glorious cover artwork for Vamp leap out at the shelf at Fopp. In fact, I saw a lot of people in store, who were probably shopping for something other than a horror flick, pick it and peruse it just out of curiosity. How many movie covers manage to do that nowadays? The people at Arrow Video have really put together a lovely package. A generous two-disc set loaded with commentaries, insightful retrospective interviews, booklets, fold-out double-sided posters and sleeves – if you’re looking for a Criterion-level package for obscure eighties horror flicks, Arrow Video meet the mark. All that’s well and good I hear you ask, but is the film any good? The plot concerns a pair of wannabe down with the crowd frat nominees who head to the big city to score a stripper as part of their initiation. When chancing upon the required establishment and discovering said strippers are vampires, hilarity and horror is assured until dawn and the end credits. Thinking ‘John Hughes does horror’ is only part of the equation as the film echoes Scorsese’s After Hours (1985) and Landis’ An American Werewolf in London (1981). Given that the above classics had come before Vamp, I would have been more appreciative of the film’s efforts had it been made a little earlier. You get the feeling while watching Vamp that it was trying something new with its take on a brat-pack style horror-comedy. Despite its intention however, the end product seems to ride the wave of what was then contemporary, without really rising above its predecessors. Vamp is like an eighties pop song that would have worked well on radio rotation with the classics of the day, but played on its own it’s more of a video curio. That said, if imitation is the sincerest form of flattery you would have noticed that the plot of Vamp bears a close resemblance to Tarantino’s From Dusk Till Dawn (1996). Indeed, from comparing the two films it’s clear that a lot of the elements have been ‘sampled’ into the latter. Viewed this way, Vamp has had its life extended twice: once in this glorious two-disc set and again in a Tarantino classic. Vamp is available to buy now. Comic Book Reviews: daytripper and Can I borrow your toilet? The first post of the New Year may as well start in mid-February. It makes for, y’know, originality. First up are a couple of gems of comic books, which I have to shout about. Can I borrow your toilet? by Gareth Brookes is a series of sketches (both in words and, well, sketches) of the various people that work in a stock room. It’s a hefty little bugger of a mini-comic that had me laughing out loud. Imagine The Office played much more deftly. The author’s choice of subjects, anecdotes and fragments of conversations manage to perfectly capture the characters, so that by the time you finish the book, you’ll think it’s time to clock-off yourself. 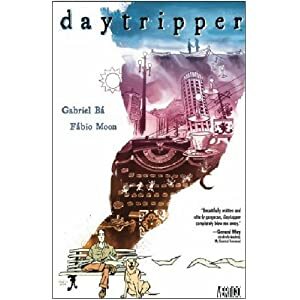 Next up, (and to those that were smart enough to jump on this book before I noticed it in collected form, I tip my hat) is Fabio Moon’s and Gabriel Ba’s daytripper. The story asks the big questions about life, while managing to walk the tightrope between fantasy and reality. Throw in Dave Stewart’s sublime colours which capture the Brazilian settings in all their different moods and you’re left with a collection of short meditations you’ll return to again and again.